McIntosh's 80,000 watt Despacio sound system is going on tour | What Hi-Fi? McIntosh will be taking its own high-end, vinyl-only club sound system on the road in 2015 to festivals in London and Ireland. The system has been made in collaboration with LCD Soundsystem’s James Murphy, who designed it with recording engineer John Klett and Belgian artists 2ManyDJs, in an effort to bring the hi-fi sound to the club environment. First revealed back in 2013, the McIntosh Despacio system comprises eight 11-foot tall McIntosh speaker/amplification towers. These towers house five amplifiers each: four MC1.2KW monoblocs and one MC452 two-channel 450W amp, and a drive unit array in a custom cabinet. The array is made up of two 21in 2000W subs, two double 15in custom-vented bass drivers, two double 12in custom vented midrange drivers, a single 1.5in 'throat' driver and a 4in compression driver for the high-frequencies, and four ‘bullet’ drivers for ultra-high-frequencies. Each stack delivers 5700W of power, and the system as a whole delivers 77,600W. Less than B&W’s 120k watt Sound System, but powerful nonetheless. 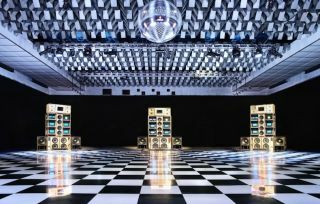 The Despacio system can be heard at Citadel and Lovebox festivals in London in July, and the Electric Picnic festival in Ireland in September. More festivals are planned.